Having this one for myself. Top of the range. It's £299.99 inc vat on a 6+23 deal for 10000 miles with Leasing Options. There is a fee of £180 for doing the deal on top. I added maintenance for about £12 per month as I thought that was cheap! There is a facelift due, therefore you can get some really tasty PCP deals on these with £6000 dealer contributions that will almost work out the same overall cost as this lease deal. Only example I have is over 48 months. Worth consideration if you prefer PCP over lease. There is a facelift due, therefore you can get some really tasty PCP … There is a facelift due, therefore you can get some really tasty PCP deals on these with £6000 dealer contributions that will almost work out the same overall cost as this lease deal. Only example I have is over 48 months. Worth consideration if you prefer PCP over lease. So is the dealer paying the deposit in this case? Facelift is already out, these may be old stock but still a great deal. On that example I posted the customer pays a £358 deposit, the Dealer is paying £5,942.35 as a 'contribution', essentially a discount of the OTR price. I found the above deal on the link below but there are multiple BMW dealers offering big discounts as it is the outgoing model. Same with Audi A4's, BMW 3 Series and Mercedes C Class, can get up to £9000 off these models in the form of deposit contributions. Are these leasing companies all linked? They seem to offer the same cars on special. Are these leasing companies all linked? They seem to offer the same cars … Are these leasing companies all linked? They seem to offer the same cars on special. a lot of the deals are manufacturer-driven. The Auto box is awesome and voted one of the best in the industry, 8 Speed and should have paddles on the M135i too. This went cold and it was £250/m. Makes no sense lol. Good luck in the snow. Ta OP. Voted hot a week ago. 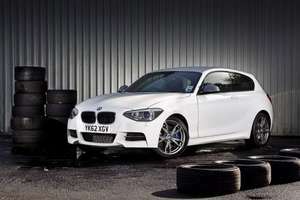 … http://www.hotukdeals.com/deals/bmw-m135i-3dr-2-year-lease-251-99-inc-vat-month-6-23-gateway2lease-1723558This went cold and it was £250/m. Makes no sense lol. that was is 6 up front. This deal is also 6 months upfront - although you can alter it to a 1+23 term and anything in between. Only difference is/was that the older deal was £1,400 cheaper over the term compared to the current deal. I dont think I could ever justify only a 24 month lease with extra 25% up front. Was offered a Skoda Superb Estate Business Edition 15k miles, 3 months + 47 for £250 inc Vat last week. Leather Interior, Sat Nav, Heated Seats, Bluetooth, etc. All ready for delivery within a week! Just checked the link & same price with them! For example, I went to a main dealer for a lease & everything was done through LEX Autolease. This same car was £179 a month 18 months ago (yes i know time machine!!) and loads bought it. Give it another 6 months when all these cars come back on the market, there will be no value in it. I would advise against buying this new ... def lease if you want one otherwise your going to take a massive hit. Same on the Golf R in 18 months time. This same car was £179 a month 18 months ago (yes i know time machine!!) … This same car was £179 a month 18 months ago (yes i know time machine!!) and loads bought it. Give it another 6 months when all these cars come back on the market, there will be no value in it.I would advise against buying this new ... def lease if you want one otherwise your going to take a massive hit.Same on the Golf R in 18 months time. Do you have a link for when it was £179 per month? Ta. ​The 8 speed auto in this car is fantastic. Try it and you will realise how great a box it is. I believe it's the ZF 8 Speed. not a dsg but a stunning box non the less. This deal is also 6 months upfront - although you can alter it to a 1+23 … This deal is also 6 months upfront - although you can alter it to a 1+23 term and anything in between.Only difference is/was that the older deal was £1,400 cheaper over the term compared to the current deal. plus the previous post might have been a spurs fan.. which didn't help his case! Yep, there has NEVER been snow in the UK......fact! If you check piston heads... there is a thread on lease deals there - it was on there. Was a rather big deal at the time as it was such a good deal! A lot of money to follow the crowd for a plastic badge. cracking deal.... Best car I've owned, stunning performance and regularly get 38 mpg on a run. Auto box is just amazing. I bought mine new 2 years ago and got £5k off list. I got the Drive the Deal 335D that was posted on here a few months ago and can confirm the auto on that car is genuinely superb. You need auto on such a quick Diesel though. I know the petrol crew love a good manual. It has a manual override anyway no? To those thinking about getting one of these 4.6-5.5 0-62 kind of cars, just do it. I've not stopped having a smile on my face since it arrived. On that example I posted the customer pays a £358 deposit, the Dealer is … On that example I posted the customer pays a £358 deposit, the Dealer is paying £5,942.35 as a 'contribution', essentially a discount of the OTR price. I found the above deal on the link below but there are multiple BMW dealers offering big discounts as it is the outgoing model.http://www.petervardy.com/bmw/new-car-offers/m135i/Same with Audi A4's, BMW 3 Series and Mercedes C Class, can get up to £9000 off these models in the form of deposit contributions. How do I see the Audi deals? How is your Volvo? I mean Skoda, I mean Kia, I mean Ford? Do you folks actually save significant money every month? The average salary in the UK is apparently £26k. When I earned over £100k many years back I just about felt comfortable buying a used car for £9k. Anyway, its your money so your choice. They should have just called this the M1 in line with the others. Anyway great price driving any BMW M range car is a joy thats hard to match. Do you folks actually save significant money every month? The average … Do you folks actually save significant money every month? The average salary in the UK is apparently £26k. When I earned over £100k many years back I just about felt comfortable buying a used car for £9k. Anyway, its your money so your choice. Why save at 0.5%? Live in the moment! !, the dinosaurs are kicking themselves! Try buying a sub 5 second 0-62 car for less, my M235i manages over 30mpg, the auto is superb. It goes on Wednesday as I just don't have the willpower to drive it slowly. The ride is a bit harsh, however I believe the 135i is a bit softer. The engine is a peach, straight 6, 3 litre and almost impossible to tell its turbo'd. It also sounds great. Don't get run flats, the Pilot Super Sports are like glue once warmed up. And once you get to 62........it just keeps on going, and going, super unleaded recommend.